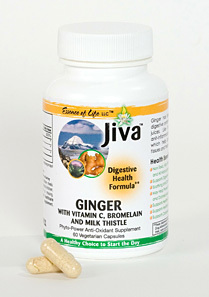 JIVA Ginger Plus Digestive Capsule Formulation Contains all natural extracts of ginger, milk thistle, Vitamin C, and bromelain. Promotes a healthy immune system, digestive health, and a healthy inflammatory response. 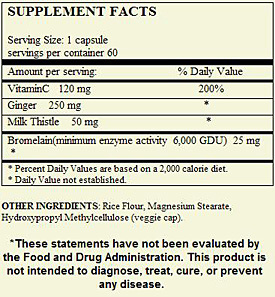 All ingredients are premium quality, 100% natural and vegetarian/vegan with no added stimulant, wheat, gluten, or MSG. Originating in southern China, Ginger plays an essential role in the Chinese diet as well as in traditional Chinese medicine. It has been used to treat diarrhea, nausea, and aid the digestive system by increasing the flow of digestive juices, which in turn speed up the time it takes for food to travel through the intestines. Like its relative, curcumin, Ginger has an anti-inflammatory, anti-tumor, anti-oxidation, antiviral, and anti-bacterial property which protects cells against oxidative damage and pathological tissue degeneration caused by inflammation that causes degenerative diseases such as Alzheimer's disease, and shortens the duration of the common cold. Research studies have indicated that Ginger could be an effective therapeutic agent to promote cardiovascular health by lowering blood pressure and cholesterol, manage the effects of diabetic complications due to its anti-diabetic and hypolipidemic properties (lowering the "bad cholesterol"), and provide protection against UVB-induced skin disorders. It has been demonstrated that Ginger can increase body temperature and adrenaline secretion that promote energy and oxygen consumption that lead to the increase of metabolism.